Ungava Peninsula has a true natural wonder – Pingualuit crater. 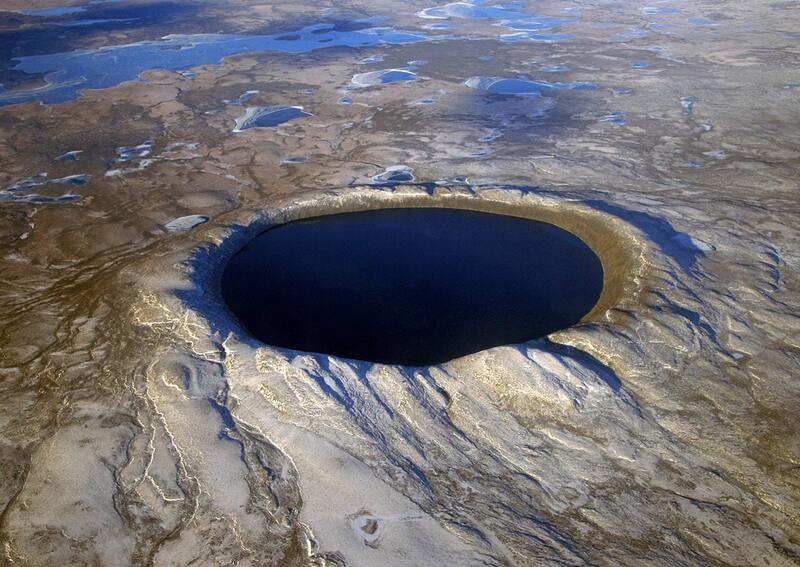 This is one of most impressive impact craters on Earth, possibly – the most impressive one. Local Inuit people knew well about this unusual lake. This eerie, unusually calm place was considered to be a site of extreme power, where one comes to revitalize himself. The name given to it though is more prosaic. "Pingualuit" could be translated as the site "where the land rises", but this translation could designate also skin blemishes due to cold weather. White people learned about this lake rather recently. It is possible that the first ones to notice it were military pilots who used this unusual, round lake for navigation. In June 1943 was taken the first known aerophotographic image of the crater. Diamond prospector Frederick W. Chubb learned about this unusual lake and became interested in it. He thought that this might be an extinct volcano and there is a possibility to find diamonds nearby. He asked for the assistance of expert – Victor B. Meen from Royal Ontario Museum. Meen immediately noticed that this looks rather like an impact crater (back then there were known just a few impact craters) and was intrigued enough to organize an expedition to this remote area together with Chubb. Meen and Chubb managed to reach the crater in 1950. Crater was named – Chubb crater. In 1951 Meen organized another expedition, researchers with magnetometer found magnetic anomaly under the northern rim of crater. It was believed that a large mass with high content of metal might be lying below the surface here. Later this proved to be wrong – meteorite evaporated during the explosion. In 1962 Ken Currie found convincing proof of impact hypothesis: impactites – rocks with characteristic deformations caused by meteorite explosion. Such rocks can even have a melted crust, which is enriched with vapour of meteorite. Upon the request of Quebec geographers, crater was renamed in 1968 – "New Quebec crater". Current – and the original local name – "Pingualuit" – was returned in 1999. Impact crater to a large extent has preserved its original, bowl shaped form. Width of Pingualuit crater is 3 440 m, depth – 400 m. Rims of the crater rise up to 160 m above the surrounding tundra. Crater rim is the highest point in whole region, 667 m above the sea level. Before the glacial ages rims definitely were higher – glaciers have eroded them. Crater sits on a bulge – catastrophic impact has fractured rocks in wide area and increased their volume. 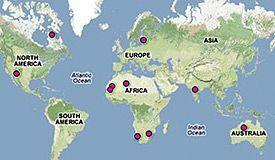 Impact took place approximately 1.4 million years ago, in Pleistocene. Meteorite hit more than 2 billion years old, Archaean granodiorite – very hard rock – and almost immediately evaporated in terrible explosion, which melted thousands of tons of stone and viped away all life for hundreds of kilometres around the crater. Analysis shows that meteorite was chondritic (stone) with siderophile element enrichment (e.g. rich with metals). In the crater is located large lake. Diameter of Pingualuik lake ir 2.8 – 3.2 km, depth – 267 m. Rims of crater rise up to 163 m above the lake level and are very steep – 30 – 45 °. It is dangerous to descend to the lake – there is only one place where one can access the water safely. Although most of lakes and rivers in Quebec are incredibly clean, Pingualuk Lake in this respect is in a league of its own. This lake has incredible transparency and contains some of the purest freshwater in the world, salinity level is less than 3 ppm. Lake in a right lighting (what is very rare here) has amazing, incredible blue color. Secchi disk is visible well over 35 m depth – one of the best results in the world. Just a few lakes, like Crater Lake in USA, Baikal in Russia and earlier measurements of Lake Mashū in Japan have results above 40 m.
This clarity of water is explained by several factors. There are no outlets and no significant inlets in this lake. For most part – from early November to July – lake is covered with ice. And finally – this is remote place – nearest village Kangiqsujuaq is 100 km west from the crater. In the lake lives Arctic Char (Salvelinus alpinus). Lake environment is very poor and as a result this isolated population of fish has interesting adaptations – thin bodies and large heads. Several glacial ages have taken place since the creation of crater. These glaciers removed all sediments from the bedrock, thus erasing all the information about the past in this part of North America. 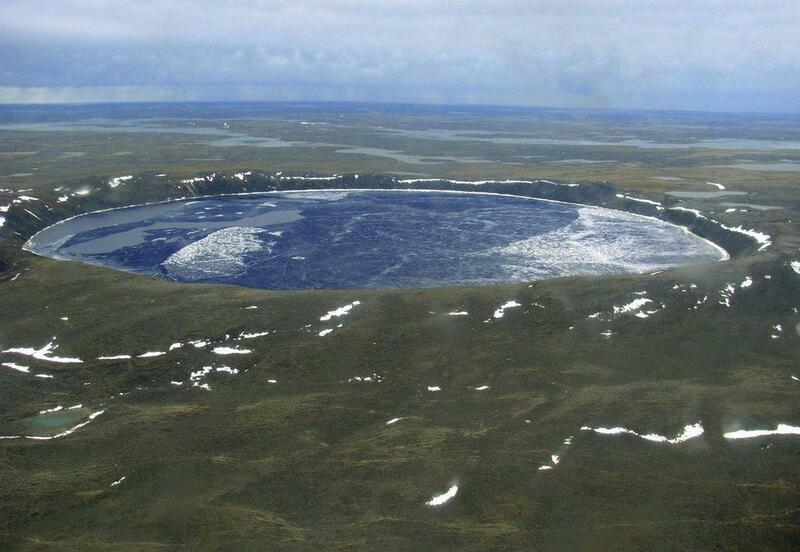 But there is hope that the bottom of Pingualuit crater was not affected – this lake most likely survived as a subglacial lake hidden deep under the blanket of glacier. An expedition in the winter of 2007 took sediment cores from the deepest place of the lake bed. Total thickness of the sediments here is 11.2 m, but the team managed to get 8.5 m long core. Research is on-going, but initial results show the sediments have "recorded" two more interglacial periods before the current one. Remnants of now extinct diatoms have been found. In order to protect the unique impact crater and pristine nature around in 2004 was established Pingualuit National Park. Crater here is the main attraction. It is not easy to reach it – Pingualuit is accessible by feet, canoe or by air. Climate here is harsh – mean yearly temperature is − 10 °C, frost-free season lasts only 20 days. Crater rim looks like a hill already from the distance of some ten kilometres. Walk towards the rim is tiresome, slopes are covered with rubble and granite boulders. View to the lake opens suddenly – but what a view! This sight might have no analogues in the world. The lake lies far below and looks closer than it is in reality. Towards the other side opens a view on primeval, endless tundra. The quietness of this place can be stunning. People can easily hear the small waves of lake beating against the shores far below. Charles O’Dale. Pingualuit impact crater. The Royal Astronomical Society of Canada. Pingualuit crater lake project. Accessed on December 27, 2012. The second largest country in world (by size) has plenty of landmarks and wonders to offer. 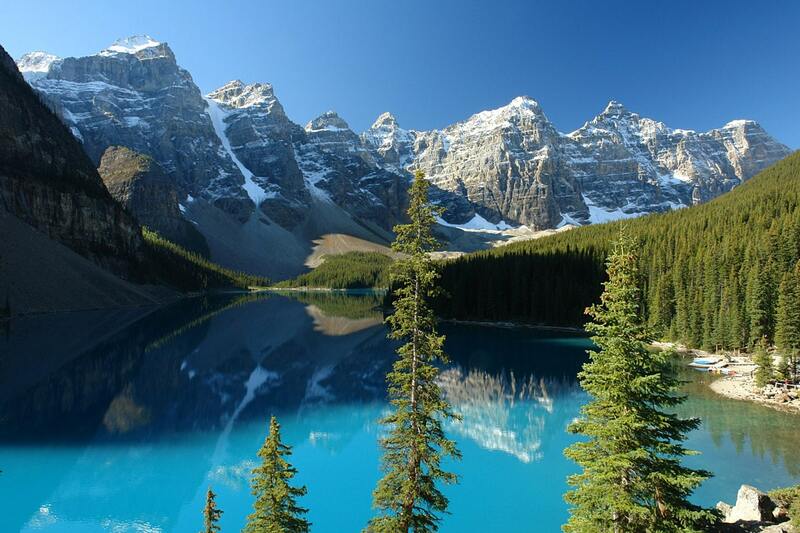 Most impressive are natural landmarks, especially the waterfalls, cliffs and other landmarks in the Canadian mountains. I taught school in the small Inuit village of Kangiqsujuaq for several years. Kangiqsujuaq is located at Quebec’s Ungava’s eastern entrance to the Hudson Strait. It is a jewel with its surrounding lands including the newly inaugurated Pingualuit Park and its waters, so rich with life. I feel blessed to have experienced life there.